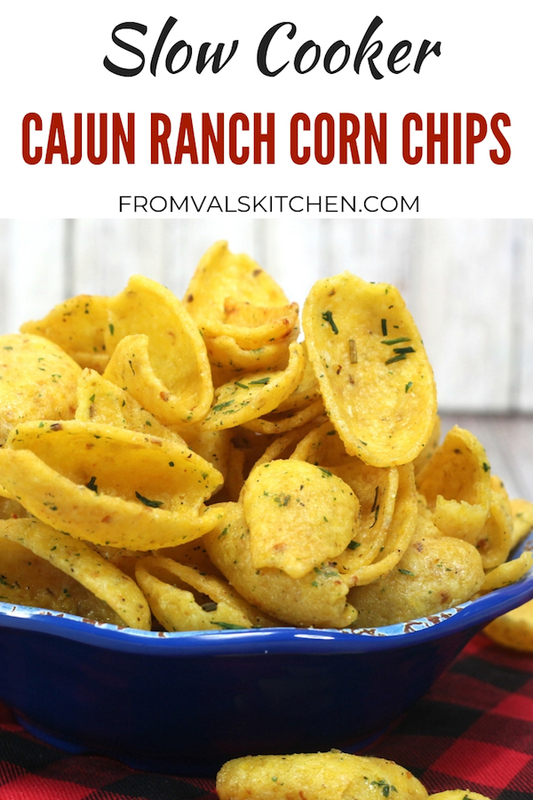 Make your own ranch corn chips with a cajun kick using this Slow Cooker Cajun Ranch Corn Chips recipe! The recipe is easily gluten-free, just check your labels. Corn chips are one of the snacks you’ll almost always find on hand in our house. It often surprises me that there aren’t more flavors of corn chips, like there are of potato chips. Ranch is one of my favorite flavors. I did see ranch corn chips once a while back but almost never do any more. 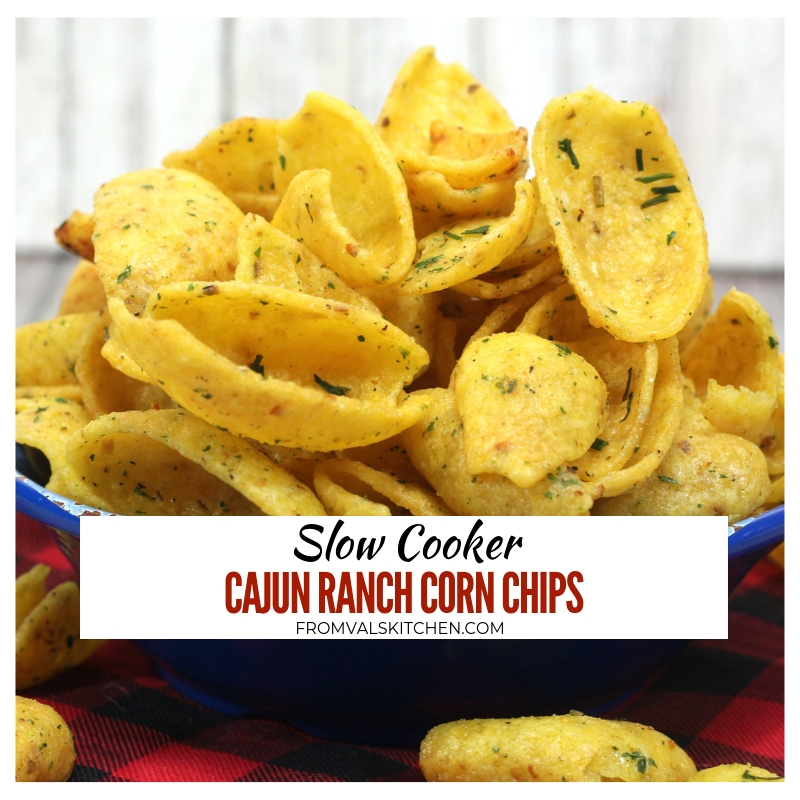 This easy recipe lets you make your own ranch corn chips with a little cajun kick. (Or, use more cajun seasoning for a bigger kick!) This recipe is easily gluten-free is you just check your labels. 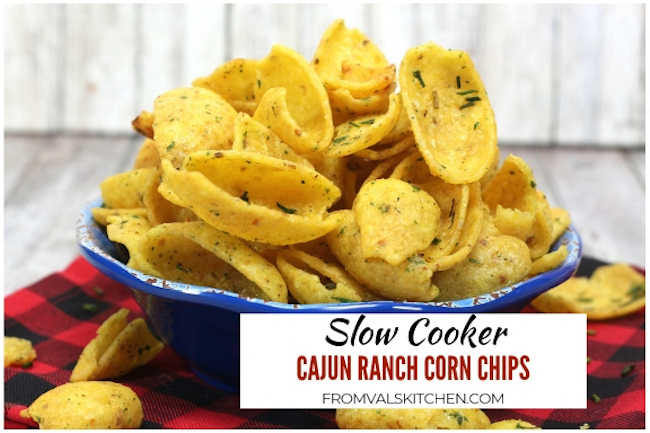 Here’s how to make Slow Cooker Cajun Ranch Corn Chips. Plug in the slow cooker and spray the inside of the insert with nonstick cooking spray. Pour the bag of corn chips into the insert. Place the melted butter, ranch seasoning and Cajun spice into a medium sized bowl and combine thoroughly. Pour the mixture into the insert with the corn chips. Set the slow cooker to cook on high for 2 hours, uncovered. Once the cooking time has completed, place the corn chips onto the cookie sheet to cool. Enjoy as is or with your favorite dip! Leftovers should be stored in an airtight container. Plug in the slow cooker and spray the inside of the insert with nonstick cooking spray. Pour the bag of corn chips into the insert. Melt the butter. Place the melted butter, ranch seasoning and Cajun spice into a medium sized bowl and combine thoroughly. Pour the mixture into the insert with the corn chips. 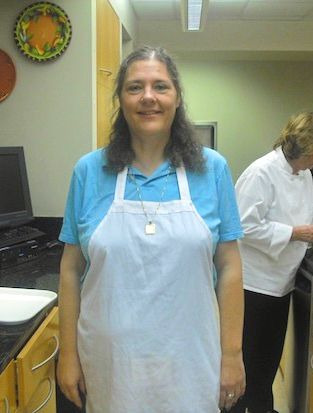 Stir well to make sure that all of the chips are coated with the melted butter mixture. Set the slow cooker to cook on high for 2 hours, uncovered. Stir the mixture occasionally. Line a cookie sheet with wax paper. Once the cooking time has completed, place the corn chips onto the cookie sheet to cool. Enjoy as is or with your favorite dip! Leftovers should be stored in an airtight container.